After graduating from the University of Sydney with a Bachelor of Molecular Biotechnology, Dr Malesu (Dentist) returned to obtain a Bachelor of Dentistry. He is accredited by the Australasian Society of Implant Dentistry and is a member of the Australian Dental Association. The further training Dr Malesu has undertaken includes topics such as orthodontics and wisdom teeth extraction. He frequently attends courses and conferences to be at the forefront of dentistry. 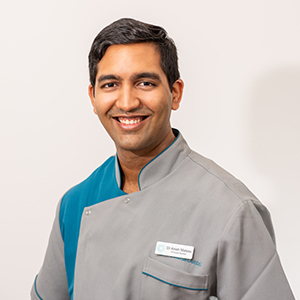 It’s his aim to provide his patients with the best care, employing modern techniques and the latest technology. Dr Malesu has a keen interest in cosmetic dentistry and general dentistry. He takes pride in transforming the smiles of his patients, focusing on functionality and aesthetics. The volunteer time he has spent at orphanages in India have allowed him to gain experience in complex surgery such as cleft lip repairs, and he has also provided general dental services to children there. In his spare time, Dr Malesu has several favourite hobbies. He enjoys dance, particularly Latin and ballroom dancing. He plays the guitar, piano and has been involved in the Rural Fire Brigade as a Senior Cadet Vice Captain. If you have a particular concern or are due for a checkup, contact 7 Pearls Dental today! We are open seven days a week and see emergency cases.